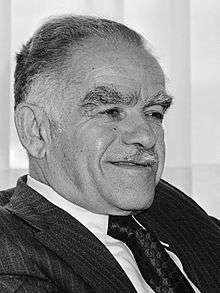 Yitzhak Shamir (Hebrew: יצחק שמיר‎, listen ; born Yitzhak Yezernitsky; October 22, 1915 – June 30, 2012) was an Israeli politician and the seventh Prime Minister of Israel, serving two terms, 1983–84 and 1986–1992. Before the establishment of the State of Israel, Shamir was a leader of the Zionist paramilitary group Lehi. After the establishment of the State of Israel he served in the Mossad between 1955 and 1965, a Knesset Member, a Knesset Speaker and a Foreign Affairs Minister. Shamir was the country's third longest-serving prime minister after David Ben-Gurion and Benjamin Netanyahu. Yitzhak Yezernitsky (later Yitzhak Shamir) was born in the predominantly Jewish village of Ruzhany, Grodno province, Russian Empire (now Belarus), which after World War I became part of Poland, as the son of Perla and Shlomo, owner of a leather factory. Those close to Shamir noted that "he often recalls his childhood and youth in Belarus." Shamir later moved to Białystok, Poland and studied at a Hebrew high school network. As a youth he joined Betar, the Revisionist Zionist youth movement. He studied law at the University of Warsaw, but cut his studies short to immigrate to what was then Mandatory Palestine. Shamir once stated that "every Pole sucked anti-Semitism with his mother's milk." The comment caused controversy within Poland as being slanderous and libelous. The Polish writer and former resistance fighter Jan Nowak-Jeziorański commented: "To conclude from the 1941 pogroms that the Holocaust was the common work of Poles and Germans is a libel. All who feel themselves to be Polish have the responsibility to defend themselves against such slander. The majority of Polish society might be charged with having an attitude of indifference to the extermination of the Jews — if not for the fact that the entire civilized world reacted to the fact of genocide with indifference and passivity. The difference is that Poles were eyewitnesses, defenseless witnesses living in constant fear for their lives and the lives of their families." His parents and two sisters died during the Holocaust. Shamir claimed his father was killed just outside his birthplace in Ruzhany by villagers who had been his childhood friends, after he had escaped from a German train transporting Jews to the death camps. However this story has never been confirmed by other sources. His mother and a sister died in the concentration camps and another sister was shot dead. Shamir once told Ehud Olmert that when his father living under Nazi occupation had been informed that the extermination of the Jews was imminent, his father had replied that "I have a son in the Land of Israel, and he will exact my revenge on them". According to an obituary, he had dreamed of living in the Land of Israel since he was a boy, and felt immediately at home when he would eventually move there. In 1935, Shamir emigrated to Palestine, where he worked in an accountant's office. He later adopted as his surname the name he used on a forged underground identity card, Shamir. He told his wife this was because Shamir means a thorn that stabs and a rock that can cut steel. In 1944 he married Shulamit, whom he met in a detention camp when she migrated to Mandate Palestine from Bulgaria by boat in 1941 and was incarcerated because she entered the territory illegally. They had two children, Yair and Gilada. Shulamit died on July 29, 2011. Shamir joined the Irgun Zvai Leumi, a Zionist paramilitary group that opposed British control of Palestine. When the Irgun split in 1940, Shamir joined the more militant faction Lehi, also known as the Stern Gang, headed by Avraham Stern. 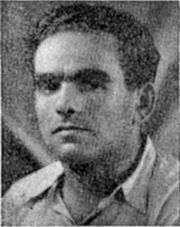 In 1941 Shamir was imprisoned by British authorities. A few months after Stern was killed by the British in 1942, Shamir and Eliahu Giladi hid under a stack of mattresses in a warehouse of the detention camp at Mazra'a and at night they escaped through the barbed wire fences of the camp. Shamir, together with Giladi, Anshell Shpillman and Yehoshua Cohen, reorganized the movement into cells and trained its members. In his memoirs, Shamir admitted in 1994 what had long been suspected: that the killing of Giladi in 1943 was ordered by Shamir himself, allegedly due to Giladi advocating for the assassination of David Ben-Gurion and arguing for other violence deemed too extremist by fellow Stern members. In 1943, he became one of the three leaders of the group, serving with Nathan Yellin-Mor and Israel Eldad. Shamir sought to emulate the anti-British struggle of the Irish Republicans and took the nickname "Michael" after Irish Republican leader Michael Collins. Shamir plotted the 1944 assassination of Lord Moyne, British Minister for Middle East Affairs, and personally selected Eliyahu Hakim and Eliyahu Bet-Zuri to carry it out. Moyne had been targeted due to his perceived role as an architect of British restrictions on Jewish immigration to Palestine, and in particular, the Patria disaster, which was blamed on him. In July 1946, Shamir was arrested. He had been walking in public in disguise and a British police sergeant, T.G. Martin, recognized him by his bushy eyebrows. Arrested, he was exiled to Africa, and interned in Eritrea by British Mandatory authorities. Lehi members subsequently tracked down and killed Martin in September 1946. In January 1947, Shamir and four Irgun members escaped through a 200-foot tunnel they had dug. Shamir and some of the others hid in an oil truck for three days as it was driven over the border to French Somaliland. They were re-arrested by the French authorities, but Shamir was eventually allowed passage to France and granted political asylum. Lehi sent him a forged passport, with which he entered Israel after the Israeli Declaration of Independence in 1948. During the Israeli War of Independence, most of Lehi's members joined the newly formed Israel Defense Forces. Lehi formally disbanded on May 29, 1948. However, the Lehi group in Jerusalem continued to function independently, outside government control. During a UN-imposed truce, Shamir, Eldad, and Yellin-Mor authorized the assassination of the United Nations representative in the Middle East, Count Folke Bernadotte, who was killed in September 1948, when Lehi gunmen ambushed his motorcade in Jerusalem. Lehi had feared that Israel would agree to Bernadotte's peace proposals, which they considered disastrous, unaware that the provisional Israeli government had already rejected a proposal by Bernadotte the day before. The Israeli provisional government drafted an ordinance for the prevention of terrorism and then invoked it to declare Lehi a terrorist organisation, consequently rounding up 200 of its members for "administrative detention" (prison). They were granted amnesty some months later and given a state pardon. Shamir publicly declared his animus for Poles by stating that "every Pole sucked anti-Semitism with his mother's milk." Shamir contradicted his spokesman, who attempted to keep the comment off the record, and insisted that he wanted his comment publicized. The comment caused controversy within Poland as being slanderous and libelous. Furthermore, Adam Michnik addressed the comment by stating "the stubborn categorization of Poland as an anti-Semitic nation was used in Europe and America as an alibi for the betrayal of Poland at Yalta. The nation so categorized was seen as unworthy of sympathy, or of help, or of compassion." Wanted Poster of the Palestine Police Force offering rewards for the capture of Lehi members: Yaakov Levstein (Eliav), left, Yitzhak Yezernitzky (Shamir), center, and Natan Friedman-Yelin (Yellin-Mor), right. In the first years of Israel's independence, Shamir managed several commercial enterprises. In 1955, he joined the Mossad, serving until 1965. During his Mossad career, he directed Operation Damocles, the assassinations of German rocket scientists working on the Egyptian missile programme. He ran a unit that placed agents in hostile countries, created the Mossad's division for planning and served on its General Staff. Shamir resigned from the Mossad in protest over the treatment of Mossad Director-General Isser Harel, who had been compelled to resign after Prime Minister David Ben-Gurion ordered an end to Operation Damocles. In 1969, Shamir joined the Herut party headed by Menachem Begin and was first elected to the Knesset in 1973 as a member of the Likud. He became Speaker of the Knesset in 1977, and Foreign Minister in 1980, before succeeding Begin as prime minister in 1983 when the latter retired. Shamir had a reputation as a Likud hard-liner. In 1977 he presided at the Knesset visit of Egyptian President Anwar Sadat. He abstained in the Knesset votes to approve the Camp David Accords and the Peace Treaty with Egypt. In 1981 and 1982, as Foreign Minister, he guided negotiations with Egypt to normalize relations after the treaty. Following the 1982 Lebanon War he directed negotiations which led to the May 17, 1983 Agreement with Lebanon, which did not materialize. His failure to stabilize Israel's inflationary economy and to suggest a solution to the quagmire of Lebanon led to an indecisive election in 1984, after which a national unity government was formed between his Likud party and the Alignment led by Shimon Peres. 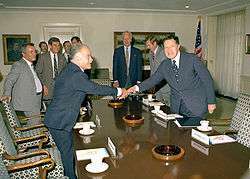 As part of the agreement, Peres held the post of Prime Minister until September 1986, when Shamir took over. As he prepared to reclaim the office of prime minister, which he had held previously from October 1983 to September 1984, Shamir's hard-line image appeared to moderate. However Shamir remained reluctant to change the status quo in Israel's relations with its Arab neighbors, and blocked Peres's initiative to promote a regional peace conference as agreed in 1987 with King Hussein of Jordan in what has become known as the London Agreement. 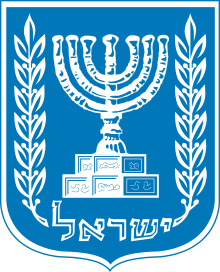 Re-elected in 1988, Shamir and Peres formed a new coalition government until "the dirty trick" of 1990, when the Alignment left the government, leaving Shamir with a narrow right-wing coalition. Shamir urged the US government to stop granting refugee visas to Soviet Jews, persuading it that they were not refugees because they already had a homeland in Israel, and were only moving to the United States for economic reasons. He also termed the emigration of Soviet Jews to the United States rather than to Israel "defection", and called the issuing of US refugee visas to Soviet Jews when Israel was already willing to take them in "an insult to Israel". In 1989, a wave of Jewish emigration began from the Soviet Union after the Soviets allowed their Jewish population to emigrate freely. In October of that year, the US agreed to his requests, and stopped issuing refugee visas to Soviet emigrants. Subsequently, Israel became the main destination of Soviet Jewish emigrants. Over one million Soviet immigrants would subsequently arrive in Israel, many of whom would have likely gone to the United States had Shamir not pressed the US government to change its policy. During the Gulf War, Iraq fired Scud missiles at Israel, many of which struck population centers. Iraq hoped to provoke Israeli retaliation and thus alienate Arab members of the United States-assembled coalition against Iraq. Shamir deployed Israeli Air Force jets to patrol the northern airspace with Iraq. However, after United States and Netherlands deployed Patriot antimissile batteries to protect Israel, and US and British special forces began hunting for Scuds, Shamir responded to American calls for restraint, recalled the jets, and agreed not to retaliate. During his term, Shamir reestablished diplomatic relations between Israel and several dozen African, Asian and other countries. In May 1991, as the Ethiopian government of Mengistu Haile Mariam was collapsing, Shamir ordered the airlifting of 14,000 Ethiopian Jews, known as Operation Solomon. He continued his efforts, begun in the late 1960s, to bring Soviet Jewish refugees to Israel. 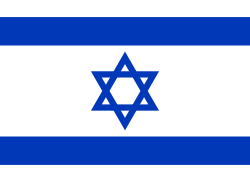 Shamir restored diplomatic relation between the Soviet Union and Israel in October 1991, and following its dissolution, established relations between Israel and his native Belarus in May 1992. Shamir was dedicated to bringing Jews from all over the world to Israel, and called on American Jews to emigrate to Israel in spite of a higher standard of living in the US, saying that he expected even American Jewish youth to realize that "man does not live by bread alone" but to "learn and understand Jewish history, the Bible... and reach the only conclusion: to come on aliya to Israel." Relations with the US were strained in the period after the war over the Madrid peace talks, which Shamir opposed. As a result, US President George H.W. Bush was reluctant to approve loan guarantees to help absorb immigrants from the former Soviet Union. Finally Shamir gave in and in October 1991 participated in the Madrid talks. His narrow, right-wing government collapsed: the participation of Palestinians in the elections from the West Bank and Gaza, was mandated by law. New elections were necessarily called. Shamir was defeated by Yitzhak Rabin's Labour in the 1992 election. 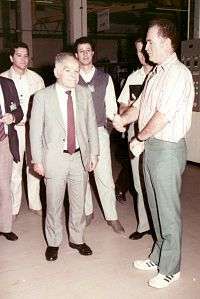 He stepped down from the Likud leadership in March 1993, but remained a member of the Knesset until the 1996 election. For some time, Shamir was a critic of his Likud successor, Benjamin Netanyahu, as being too indecisive in dealing with the Arabs. Shamir went so far as to resign from the Likud in 1998 and endorse Herut, a right-wing splinter movement led by Benny Begin, which later joined the National Union during the 1999 election. After Netanyahu was defeated, Shamir returned to the Likud fold and supported Ariel Sharon in the 2001 election. Subsequently, in his late eighties, Shamir ceased making public comments. In 2004, Shamir's health declined, with the progression of his Alzheimer's disease, and he was moved to a nursing home. The government turned down a request by the family to finance his stay at the facility. You're cast stone, Isaac, unbreakable. Bearing on your shoulders the burden of this nation the past and the future. Remembering in your heart the ashes of the crematoria and the hope of redemption. Nothing could distract you out of your way. Iron tools and weapons of destruction could not touch you, could not threaten you. Flattery, bribery, and double talk — were never on your tongue, were not part of your language. Only one small weakness relentlessly gnawed at you. Only one small weakness managed to break through the solid rock to carve the stones, and build from them the foundations to establish the kingdom of Israel. It was love: Your love of this persecuted people; your love of the homeland of our fathers, of the land of eternity; your love of your children, your home; your love of your Shulamit... Sir, commander of Israel's Freedom Fighters, my man, Speaker of the Israeli Knesset, my honored Prime Minister of Israel and an eternal soldier. On my behalf, on behalf of your friends and subordinates; on behalf of the congregation of Israel, on behalf of anonymous soldiers, in the service of the country and in the underground; in the name of the State of Israel, we bow our heads to you. You were dedicated to the people all your life, and now 'from duty be released only by death.' 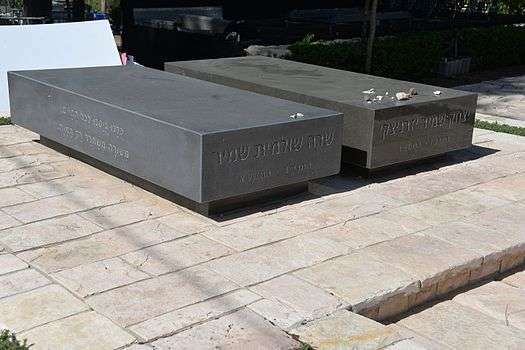 In a few hours we'll say our goodbyes, when you'll be interred in the ground of Jerusalem, the ground of this good land, for which you have lived and fought. 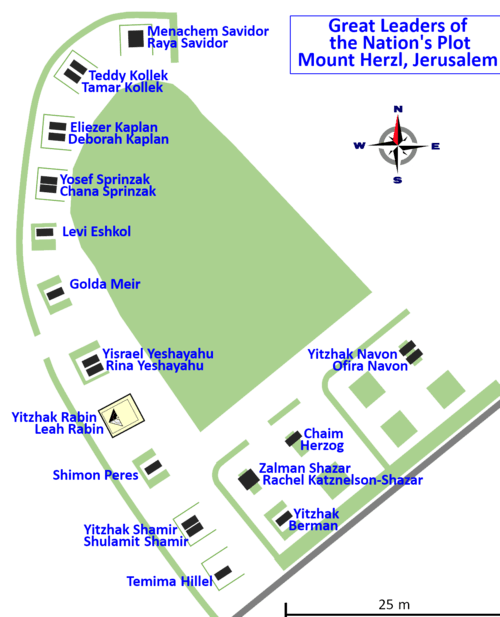 Shamir was buried at Mount Herzl. Israeli President Shimon Peres said that "Yitzhak Shamir was a brave warrior for Israel, before and after its inception. He was a great patriot and his enormous contribution will be forever etched in our chronicles. He was loyal to his beliefs and he served his country with the utmost dedication for decades. May he rest in peace." Prime Minister Benjamin Netanyahu's office issued a statement upon hearing of his death that read: "[Shamir] led Israel with a deep loyalty to the nation. [The Prime Minister] expresses his deep pain over the announcement of the departure of Yitzhak Shamir. He was part of a marvelous generation which created the state of Israel and struggled for the Jewish people." This was despite previous feuds between the two once-Likud members. He was also mourned in the Knesset. Foreign Minister Avigdor Lieberman added that Shamir "contributed greatly to the foundation of the state, which he served his entire life with loyalty and unwavering dedication. He set an example in each position that he held. I had the privilege to be personally acquainted with Shamir, and I will always remember him and his great contribution to the state;" while Defense Minister Ehud Barak said: "His whole life, Shamir was as stable as granite and maintained focus without compromises. He always strived to ensure Israel's freedom. His devotion knew no bounds [and he] always sought what's right for the people of Israel and for the country's security." "he was a determined prime minister who dedicated his life to the state. He followed his ideological path honestly and humbly, as a leader should. The citizens of Israel will always remember the wisdom he demonstrated during the First Gulf War. He showed restraint and saved Israel from undue entanglement in the Iraq War. This decision proved to be a brave and wise act of leadership." [My father] belonged to a different generation of leaders, people with values and beliefs. I hope that we have more people like him in the future. His political doing has undoubtedly left its mark on the State of Israel. Dad was an amazing man, a family man in the fullest sense of the word, a man who dedicated himself to the State of Israel but never forgot his family, not even for a moment. He was a special man. In 2001, Shamir received the Israel Prize, for his lifetime achievements and special contribution to society and the State of Israel. He wrote Sikumo shel davar, a book which was published in English by Weidenfeld and Nicolson, London, as Summing Up: An autobiography (1994). ↑ Knesset Member, Yitzhak Shamir Archived March 4, 2016, at the Wayback Machine. 1 2 Former Israeli Prime Minister Yitzhak Shamir dies at 96 Israel News | Haaretz Daily Newspaper Archived April 29, 2015, at the Wayback Machine. ↑ Bregman, Ahron (2003), A History of Israel, Palgrave Macmillan, p. 205 . ↑ Died former Israeli Prime Minister Yitzhak Shamir, Rambler Media Group . ↑ Wilson, H. W. (1996), Graham, Judith et al., eds., Current Biography Yearbook, 1996, H. W. Wilson CS1 maint: Uses editors parameter (link). ↑ Obituary: former Israeli Prime Minister Yitzhak Shamir Archived March 4, 2016, at the Wayback Machine. ↑ When Shamir revealed how his parents and sisters were killed in the Holocaust | The Times of Israel Archived March 4, 2016, at the Wayback Machine. ↑ "Archived copy". Archived from the original on 2016-03-03. Retrieved 2012-08-09. ↑ "A fighter for Israel". The Economist. ↑ Golan 2011, p. 143. ↑ "The eulogizer: Shamir Abutbul Sundlun Pearle", Heritage FL, 2011-08-15 . ↑ "Yitzhak Shamir celebrated his 85th birthday", Jewish post . ↑ Israel national news . ↑ Mearsheimer, John J; Walt, Stephen M (2007), The Israel Lobby and U.S. Foreign Policy, Farrar, Straus & Giroux, p. 102 . ↑ "Stern Gang", A Dictionary of World History, Oxford Reference Online, Oxford University Press, 2000 . ↑ Ben-Tor, Nechemia, The Lehi Lexicon (in Hebrew), p. 61 . ↑ Golan 2011, p. 94. ↑ Shamir Memoirs Say He Ordered Killing in 1943 Archived March 8, 2016, at the Wayback Machine. ↑ In Memoirs, Shamir Admits '43 Killing Archived March 4, 2016, at the Wayback Machine. ↑ Shindler, Colin (2001), The Land Beyond Promise: Israel, Likud and the Zionist Dream, IB Tauris, p. 177 . ↑ O'Neill, Joseph (2009), Blood-Dark Track: A Family History, Harper Perennial, p. 216 . ↑ Joffe, Lawrence (July 1, 2012). "Yitzhak Shamir obituary". The Guardian. London. ↑ Okun, Shlomo (ed. ), The Kenyan Exiles (in Hebrew), pp. XXI–XXIV . ↑ Golan 2011, pp. 122, 144–45. ↑ Shomron, David (2008), "We Saw Him As the Head of Lehi", Ahimeir, Itzhak Shamir: As Solid As a Rock (in Hebrew), Yediot Aharonot and the Jabotinsky Institute, p. 103 . ↑ Ben-Yehuda, Nachman (1995), The Masada Myth: Collective Memory and Mythmaking in Israel, University of Wisconsin Press, p. 324 . ↑ Pedahzur, Ami; Perliger, Arie (2011), Jewish Terrorism in Israel, Columbia University Press, p. 28 . ↑ Anshel Pfeffer, Haaretz, "Shamir was right about one thing"
↑ Adam Michnik, editor-in-chief, Gazeta Wyborcza, "Poland and the Jews", a speech at Central Synagogue in New York Archived October 16, 2015, at the Wayback Machine. ↑ Golan 2011, p. 147. ↑ Targeted killings - a retro fashion very much in vogue Archived March 3, 2016, at the Wayback Machine. ↑ "Archived copy". Archived from the original on 2015-04-02. Retrieved 2012-08-12. ↑ Golan 2011, pp. 219, 223. 1 2 3 4 Ynet News, IL . 1 2 3 Middle east, Al Jazeera, 2012-06-30 . ↑ Rivlin, Reuven, Knesset, IL . ↑ Shamir, Eban; Ben-Porat, Garner (May 2001), "Israel Prize", The Jewish Week . ↑ "Ytzchak Shamir", Israel Prize (recipient's CV) (in Hebrew), IL: Ministry of Education . ↑ "Judges' Rationale for Grant to Recipient", Israel Prize (in Hebrew), IL: Ministry of Education . Benvenisti, Meron (January–February 1995). "The Last Revisionist Zionist". Foreign Affairs. .
Brinkley, Joel (August 21, 1988). shamir.html?pagewanted=all "The stubborn strength of Yitzhak Shamir" Check |url= value (help). The New York Times. Retrieved July 9, 2008. Golan, Zev (November 1, 2011). Stern: The Man and His Gang. Yair Publications. ISBN 978-965-91724-0-5. Heller, Joseph (1995). The Stern Gang: Ideology, Politics and Terror, 1940–1949. London: Frank Cass. Nowak-Jezioranski, Jan (January 26, 2001). "A Need for Compensation". Rzeczpospolita. Peres, Shimon (1995). Battling for Peace. New York. Shamir, Yitzhak (1994). Summing Up. London. Shindler, Colin (1995). Israel, Likud and the Zionist Dream: Power, Politics, and the Zionist dream from Begin to Netanyahu. London. Shindler, Colin (2002). The Land Beyond Promise: Israel, Likud and the Zionist Dream. London. West, Benjamin (1959). Jews Under Soviet Rule. Tel Aviv. Wikimedia Commons has media related to Yitzhak Shamir.